For World Book day, we thought we would dig up one of Banting’s books. 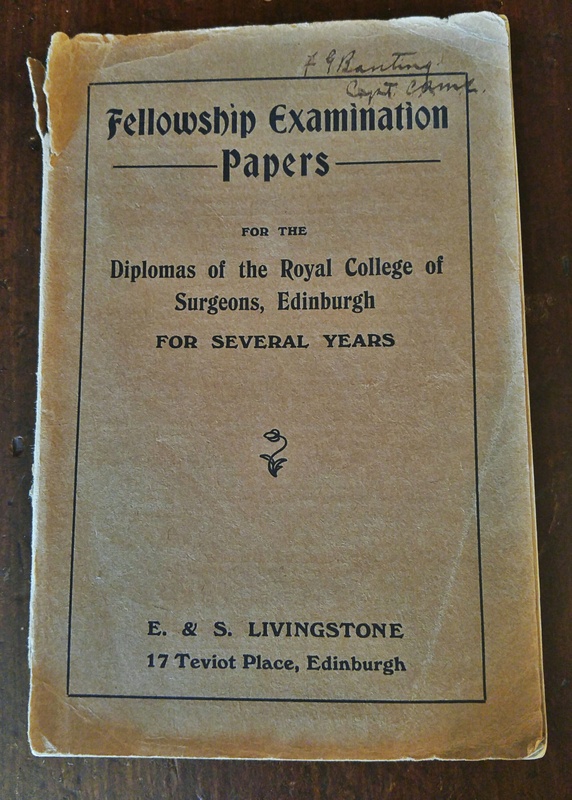 Although there are many to choose from, his Fellowship Examination Papers booklet can provide some inspiration. 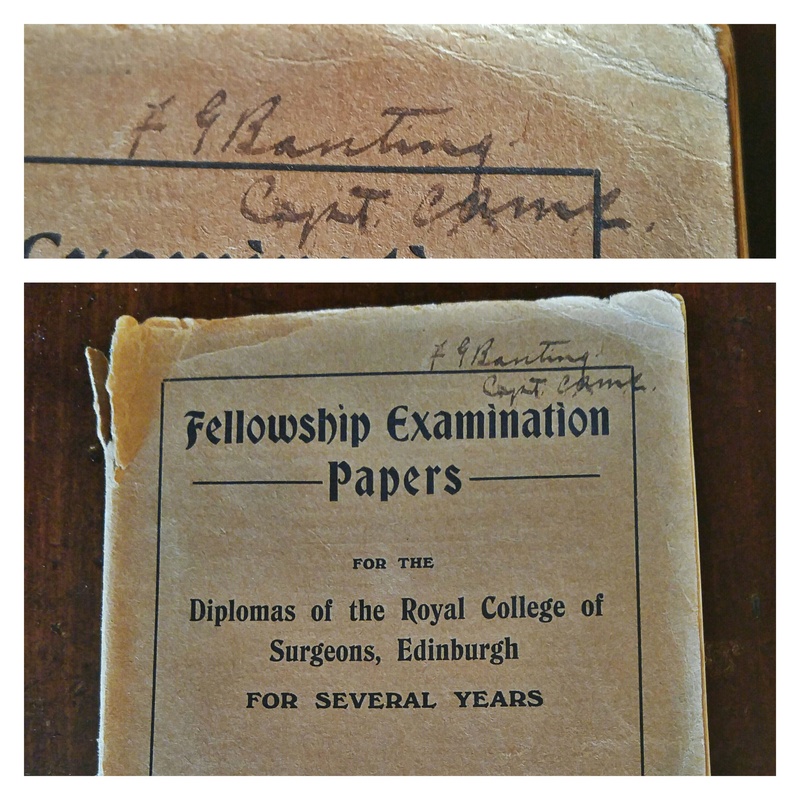 In 1918, Frederick Banting took the examinations in the hope of joining the Royal College of Surgeons of Edinburgh. Unfortunately, it didn’t go so well for Banting as he failed the examinations. Feeling defeated, Banting wrote to his mother in a letter: “I will sooner win the military cross than get into the college”. Unbeknownst to him of course, he would in fact be correct. Although Banting was enthusiastic to join the fight during the First World War, his poor eyesight caused him to be rejected from the military. He was finally able to enlist in the Canadian Army Medical Corps in 1915. In France, he acted as a medical officer and saw action in the Amiens-Arras area and near Cambrai. He spent his time carefully caring for the wounded but in late September, 1918, Banting himself became in need of medical help. During enemy fire, Banting was wounded by shrapnel in his right arm when a German shell exploded nearby, just weeks before the Armistice in November 1918. The story goes that Banting, despite needing medical care himself, selflessly continued to help his patients in an attempt to save lives. For his gallantry, bravery, and determination under fire, Banting was awarded the Military Cross in 1919. It wasn’t until 1930, some eleven years later, that Banting was finally admitted into the College. Success doesn’t always follow the first attempt but our character can yield something great. Banting’s Fellowship Examination Papers can be found in the Banting House National Historic Site Collection and were the gift of Dr. Rix Wyatt in 1989. Posted in Behind the Scenes at Banting House, Collection.Tagged Banting, Banting House NHSC, London, World Book Day.